Luther: If I had all the Franciscan friars in one house, I would set fire to it. ... To the fire with them! Anabaptists and Roman Catholics together? Yes, some do unite on at least one issue, the intolerance of Martin Luther. Over on the CARM boards a participant with seemingly Anabaptist leanings has been actively posting against John Calvin and Martin Luther. The view being expressed is that Luther was "a demon possessed wicked butcher" (link), and "His actions speak louder than his words, he was responsible for the death of untold thousands." This person went to point some fingers at me: I was described as someone who "make[s] excuses" for "demonic murderers" (link). When I offered some documentation on misused quotes, the response back was, "You are full of it" (link) and I'm "simply wrong" (link). Then I was provided with this overall assessment: "You ought to to be ashamed of yourself, but guys like you would have been the ones to carry the green wood to the burning stake" (link). One of the frightening aspects of this was the threat, "I would like to tell you face to face what you are" (link). This person put forth a number of Luther quotes, sort of in a hodgepodge way, which I suspect were a direct cut-and-paste from a page like this or this. I'd like to look at some of these quotes. Maybe Luther won't be exonerated for each quote (for he was a sinner, and he did make some outrageous statements), but I don't think any of them prove he was a "a demon possessed wicked butcher" or "responsible for the death of untold thousands," and hopefully by the conclusions of this, my words won't be construed as an example of "making excuses." "If I had all the Franciscan friars in one house, I would set fire to it. ... To the fire with them!" This quote can be found throughout cyberspace. One author comments of this quote, "It is impossible to understand how any educated Christian leader could take such a position even when one understands the environment in which they lived." Another person comments, "Even some of Protestantism’s most celebrated names are quoted as promoting violence in the name of the Christian God." Let's take a closer look at it to see what's going on. Yes, there was an historical situation that provoked Luther's comment, and while I don't condone the comment, I can understand why Luther made the comment. Typical of the Internet, the quote is often used without any documentation. When it is documented (as it was on CARM), one particular string of references reoccurs: "Grisar, VI, 247; Table Talk [edited by Mathesius], 180; summer 1540." "Grisar, VI, 247" is not a writing from Luther. It refers to the sixth volume in a lengthy biography of Luther by Roman Catholic historian Hartmann Grisar. 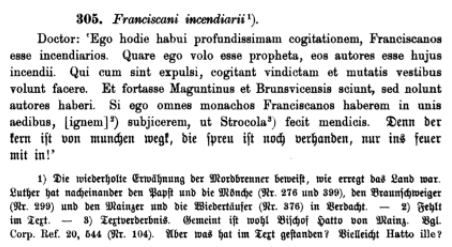 The heading that Grisar used for which he placed the quote is entitled, "Luther's Intolerance." The picture Grisar paints of Luther is that of a man who expressed religious toleration early in his career (when his views were under attack), and intolerance later (when he achieved notoriety and was part of the political establishment). (5) Mathesius, "Tischreden," p. 171. Grisar's biography of Luther was originally written in German (3 volumes). This paragraph can be found here in German. Other than locating Grisar VI, for those not familiar with these old references, the documentation is not as simple to track down. 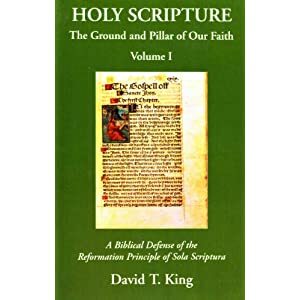 Grisar did not exactly take this material from something Luther actually wrote, but rather the Tischreden or Table Talk, a collection of statements Luther is purported to have made. This particular text comes from the pen of John Mathesius. He complied comments Luther is said to have made in 1540 (Table Talk statements numbered 4858 to 5341 found in WA, TR 4 and 5). The version of the Table Talk Grisar utilized appears to be similar to this: Luthers Tischreden in der Mathesischen Sammlung: aus einer Handschrift der Leipziger Stadtbibliothek. Page 171 can be found here. Page 180 can be found here. (1179) Luther's "Tischreden" in "Mathesischen Sammlung," No. 10. Denifle's original German text can be found here. He is citing the same text as Grisar, Table Talk statement 305, found on page 180. The same Table Talk text can be found in WA TR 4:687 (entry 5160). This utterance was not included in the English edition of Luther's Works, and to my knowledge, there is not an official translation available from the compilers of the English edition of Luther's Works. I checked a number of early English versions of the Table Talk, and I did not come across this specific utterance. In this Table Talk statement, Luther refers to himself as a prophet explaining that he knows who is setting devastating fires: Henry of Brunswick. Henry had used the territoriality expelled Franciscans to sneak back (in disguise) and set the fires. In 1540, during the hot summer, numerous fires broke out in North and Central Germany, causing widespread alarm; certain alleged incendiaries who were apprehended were reported to have confessed under torture that this was the doing of Duke Henry of Brunswick and the Pope. Before even investigations had commenced Luther had already jumped to the conclusion that the real author was his enemy, the Catholic Duke, backed up by the Pope and the monks; for had not the Duke (according to Luther) explained to the burghers of Goslar that he recognized no duties with regard to heretics? The Franciscans had been expelled and were now in disguise everywhere "plotting vengeance"; they it was who had done it all with the assistance of the Duke of Brunswick and the Elector of Mayence, who, of course, remained behind the scenes. "If this be proved, then there is nothing left for us but to take up arms against the monks and priests; and I too shall go, for miscreants must be slain like mad dogs." Hieronymus Schurf, as the cautious lawyer he was, expressed himself in Luther's presence against the misuse of torture in the case of those accused and against their being condemned too hastily. Luther interrupted him: "This is no time for mercy but for rage!" (Grisar IV, 293]. Luther's writings do demonstrate the Reformer expressed intolerance towards his perceived enemies, particular situations, or those he considered antagonists of the Gospel. But, according to the very source cited on CARM (Hartmann Grisar), the words were not intended to be taken literally. Am I making excuses? No, I don't think so. Luther did say outrageous things. He did express intolerance. This quote though does not prove Luther was "a demon possessed wicked butcher," and that "he was responsible for the death of untold thousands." 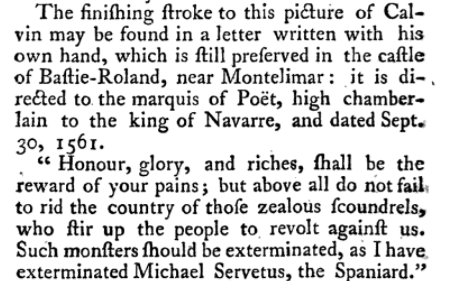 Calvin: I have exterminated Michael Servetus the Spaniard. This quote has been around for quite awhile, receiving its popularity because of its negative reference to Michael Servetus, "I have exterminated Michael Servetus the Spaniard." Here, Calvin directly admits to having Servetus killed. This admission would be contrary to the popular defense of Calvin's involvement that he had no authority in Geneva to put anyone to death. Here is not the place to delve into a defense or prosecution of Calvin's involvement in the execution of Servetus. What interested me is the actual letter this quote comes from and the possibility it may be a forgery. * Works of Voltaire translated by Smollet, and Franklin, &;c.—Lond. 1763. vol. iv. pp. 82—84. It appears that Voltaire was the source for this popular quote, and the English translator provided the form that it's in. A contemporary English version of Voltaire's words can be found here. Voltaire had a severe view of Calvin (as this biographical book documents). This letter from Calvin cited by Voltaire does indeed exist. It was included in Dr. Jules Bonnet's collection of Calvin's letters, published in French in the 1850's. There is an English translation of Calvin's letters from Bonnet's French. The letter in question can be found in Letters of John Calvin Vol. IV, pp. 439-440. There is a typo in the English translation. In the letter below, the date is said to be "8th September, 1561." The French version verifies that this is an error, the actual date should have been September 13, 1561. XVII.—To MONSEIGNEUR, MONSEIGNEUR DU POET, GRAND CHAMBERLAIN OF NAVARRE AND GOVERNOR OF THE TOWN OF MONTELIMART, AT CREST..
MONSEIGNEUR :—What have you judged of the Colloquy of Poissy? We have conducted our business safely. The Bishop of Valence as well as the others have signed our profession of faith. Let the king make processions as much as he pleases, he will not be able to hinder the preaching of our faith, harangues in public, nor gain anything except to stir up the people already too disposed for rebellion. The brave Seigneurs de Montbrun and de Beaumont abandon their opinions. You spare neither courses, nor cares; labour, you and yours will find their turn (sic). One day, honour, glory, and riches will be the reward of so much pains. Above all, do not fail to rid the country of all those zealous scoundrels that stir up the people by their discourses to make head against us, blacken our conduct, and wish to make our belief pass for a reverie. 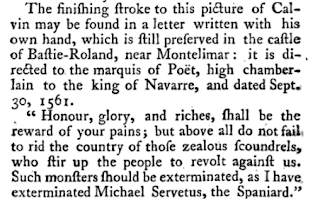 Such monsters should be smothered, as I have done here, by the execution of Michel Servetus the Spaniard. Do not imagine that in future any one will take it into his head to do the like. For the rest, Monseigneur, I forgot the subject for which I did myself the honour to write to you, which is humbly to kiss your hands, supplicating you to take in good part the quality which I shall covet during my whole life of . . .
At Geneva, this 8th September, 1561. 1st. These originals, written by Calvin’s own hand (as Voltaire affirms), are anything but autographs. They are neither in the handwriting of Calvin, nor in that of Jonvillers his secretary, nor of Antony Calvin, who sometimes held the pen under the dictation of the Reformer during the latter years of his life. 2nd. If these pieces are not in the handwriting of Calvin, still less do we find in them his style, admired by Bossuet himself and one of the finest in our language. That style is concise, nervous, and dignified, bearing the impress of a strong individuality more easy to caricature than to imitate. 3rd. From the form let us pass to the substance. The two letters swarm with mistakes and historical blunders which betray the work of an unskillful forger. The first, dated the 8th May, 1547, and addressed to M. du Poet, General of the Religion in Dauphiny, bestows this title on this seigneur, fifteen years before the period in which he declared for the Reformation, and when the new faith, having neither church nor soldier in Dauphiny, could scarcely enumerate some obscure martyrs in that province. The second, dated the 13th September, 1561, has for superscription — to M. du Poet, grand chamberlain of Navarre and Governor of Montelimart, dignities with which he was invested only twenty years later, in 1584. It is one of Calvin’s accusers, M. Aubenas himself, who informs us of that, without remarking that the notice which he has devoted to M. du Poet is the best refutation of the authenticity of the letters attributed to the Reformer. The first reason given does not necessarily prove the letter is a forgery. I would assume Dr. Bonnet was familiar enough with the writing styles of the men he mentions, yet it does not rule out that Calvin could have dictated the letter to someone else as an exception. The second reason given is even less convincing. However, the third reason, of blunders with dates, is compelling. The alleged letter gives someone a title he did not hold until twenty years later... that is indeed a problem, and it's enough then to pull the letter from historical evidence until further notice. I did a cursory search to see if any more recent Calvin scholarship discussed the letter, and did not come across anything, yet. When I mentioned in dialog that the letter is a suspected forgery, the response given back was "James I Don't believe you, both quotes are found in numerous places especially the quote about Servetus." But then again, this person thinks Calvin was a "demon possessed murderer" so it probably wouldn't matter if there were a dozen more reasons proving the letter spurious. Martin Luther Supported Gay Marriage? I came across two interesting blog articles refuting the notion that "Martin Luther possibly equivocated on the sinfulness of homosexual behavior..."
I would have handled the source material differently. For instance, I would not have begun my defense of Luther by sourcing the Table Talk. I also would have sourced the folks attempting to use Luther in support of homosexuality. Other than that, these entries are a nice topical treatment of Luther's words in regard to this issue. with link to an older debate with Gerry Matatics on same issue.